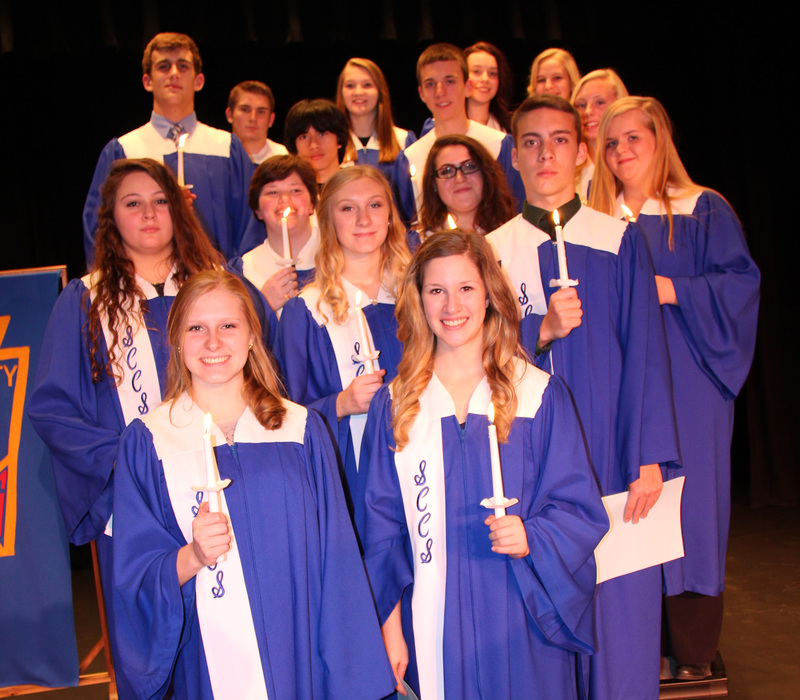 SANDY CREEK – The Carpe Diem Chapter of the National Honor Society at Sandy Creek High School inducted 16 new members at a ceremony held Nov. 10 at the school. 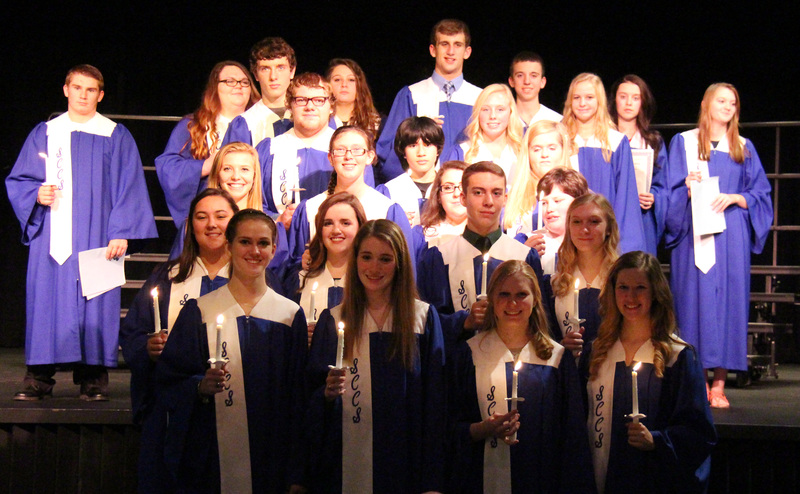 New members inducted into the Sandy Creek Carpe Diem Chapter of the National Honor Society are pictured following the ceremony. In front, left to right are: Jessica Leppien and Kim Distasio. Middle row, left to right are: Adrianna Palmer, Hannah Sawchuck, Lindsey Goodnough, Elizabeth Hall, Chase Pappa and Stephanie Brown. In back, left to right are: Jesse Cornell, John McGrew, Nicholas Radford, Dallas Blair, Adam Yerdon, Sophie Walter, Abigail Widrig and Alexis Ladd. Membership in the National Honor Society is more than just a recognition of scholastic achievement, the NHS’ four principles of character, scholarship, leadership and service represent the qualities that members in the elite organization also possess. Community service is a large aspect of membership into the Sandy Creek chapter as described during the ceremony by chapter adviser, Kelly Halko. She explained how NHS members at Sandy Creek recently coordinated a local CROP walk to benefit food pantries in the area and will participate in blood drives, holiday gift and food basket giveaways and more throughout the school year. Kim Distasio exits the auditorium during the recessional portion of the new member induction ceremony for Sandy Creek’s National Honor Society. Current members and chapter officers shared the four principles and following the NHS oath. Each new member was recognized and congratulated by Sandy Creek High School Principal Maureen Shiel and Superintendent of Schools Stewart Amell. 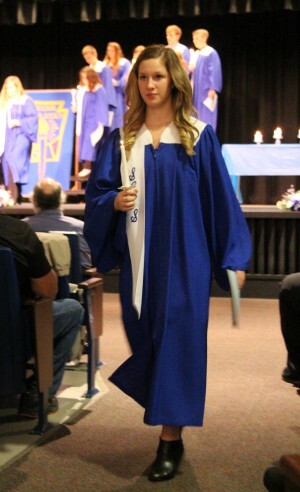 Amell noted with pride that the inductees represent one third of the entire class of juniors at the school. It was further noted by Principal Shiel that the new inductees are involved in many other activities in the school. The Sandy Creek Carpe Diem Chapter of the National Honor Society are pictured following the recent induction of new members ceremony held at the school. New members Dallas Blair, Stephanie Brown, Jesse Cornell, Kim Distasio, Lindsey Goodnough, Elizabeth Hall, Alexis Ladd, Jessica Leppien, John McGrew, Adrianna Palmer, Chase Pappa, Nicholas Radford, Hannah Sawchuck, Sophie Walter, Abigail Widrig and Adam Yerdon, join current members Rosaleen Morgan, Brigid McClusky, Kate Hanni, Morgan Ranieri, Chelsey Blodgett, Tyler Brown, Dylan Bryant, Emily Cheney, Andrew Olin and Kasey Yerdon to make up the Carpe Diem Chapter of the National Honor Society at Sandy Creek High School.